Nothing says “We’re a perfect pear” better than this dessert! In a large pot, combine the wine, cinnamon, cloves, vanilla, and sugar. Now, get your pears ready by peeling them and cutting the bottom end so they stand tall. In the poaching liquid they go! (You may need to weigh them down with an upside-down pot lid.) Bring the liquid to a boil and then simmer. For how long? Until the pears are deliciously soft and easily pierced with a knife. It really depends on how ripe the pears are – very hard Bartlett pears can take over an hour, where ripe pears should only take about 15 minutes. No hurry, this is a great aromatherapy! 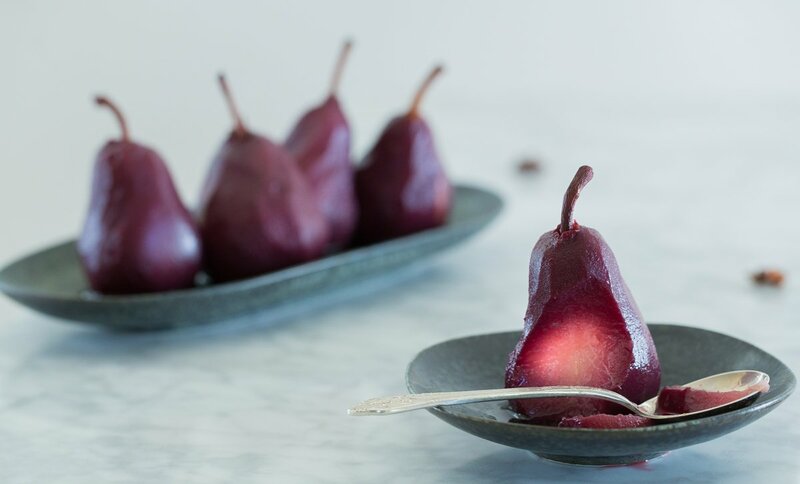 To serve the pears in a saucy way, remove the pears from the liquid when cooked, and then continue reducing until only about 1 cup of the liquid remains. When this cools, it will be a wonderful, flavorful, beautiful syrup. Say “You’re plum perfect” with a Hipcooks Gift Certificate! 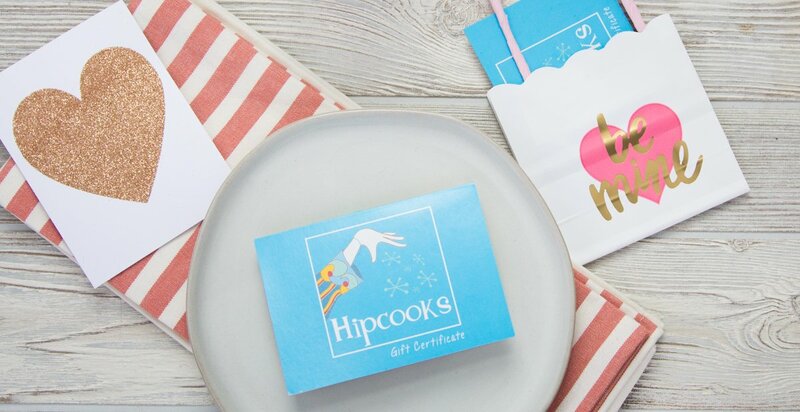 Our Gift Certificates never expire & if your Sweetpea is well, shall we say, challenged in the kitchen, then Hipcooks is a super-fun way to inspire & engage. Hipcooks students love to practice on their Best Beloveds, so it’s a win-win for you, Dumpling.